Dr. Adams, who is scheduled to speak on Thursday at a conference in Atlanta, emphasized in the advisory that more opioid users, as well as their families and friends and anyone who regularly comes into contact with them, should carry naloxone. 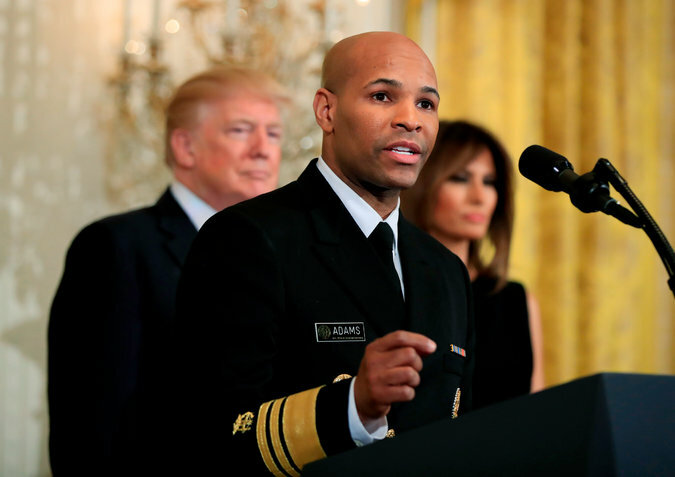 Surgeon General Jerome Adams in February. The advisory issued Thursday was the first from the office since 2005. The last advisory from a surgeon general, in 2005, warned pregnant women against drinking any alcohol; a previous advisory in 1981 urged pregnant women to limit the amount of alcohol they drank. The biggest factor in the increase in overdoses has been synthetic fentanyl and related highly toxic substances. Drug deaths involving fentanyl more than doubled from 2015 to 2016, accompanied by an upturn in deaths involving cocaine and methamphetamines. Together they add up to an epidemic of drug overdoses that is killing people at a faster rate than the H.I.V. epidemic at its peak. Fentanyl is so powerful that emergency responders have often had to use multiple doses of naloxone to revive people who overdosed on it. Some critics have said it gives drug users a safety net, allowing them to overdose repeatedly with the assurance that they can be revived. But public health experts dismiss that notion as ridiculous, like saying seatbelts encourage riskier driving. The price of naloxone has risen sharply as it has become more in demand, and though individuals can often get it at little or no cost through insurance or public programs, many local police, fire and health departments are struggling with the growing cost, which takes ever-larger chunks of their budgets. Dr. Leana Wen, the health commissioner in Baltimore, said her city has to ration naloxone because it can’t afford to keep a stockpile on hand. She called on the Trump administration to negotiate directly with the manufacturers of naloxone to make it available at a steeply discounted rate.